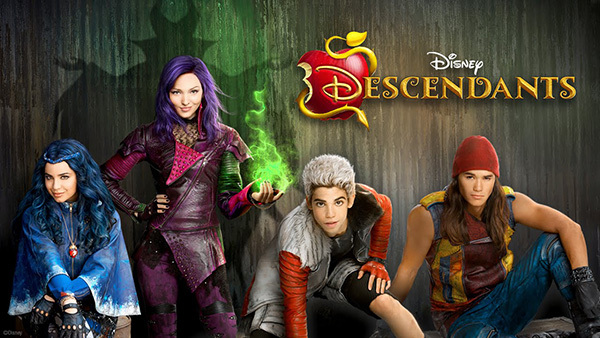 Did you catch the premiere of Disney’s Descendants on Disney Channel at the end of July? Our kids saw the trailer for it and planned to watch it. But, of course, life got in the way and it didn’t happen. And, our sometimes-I-won’t-record DVR didn’t do it’s job either. That’s ok, the same day it premiered on Disney Channel it was also available on DVD. No wait time! Not only did we picked up the DVD at Walmart, but we also threw in the official movie soundtrack. If you aren’t familiar with Disney Descendants, let me to introduce you. It features four infamous villains that we all know: Maleficent, the Evil Queen, Jafar, and Cruella De Vil, and they have been imprisoned on the Isle of the Lost. Their children are also there, although they have never been off the island. That is, until the teenage son of King Beast and Queen Belle announces that his first proclamation will be a chance at redemption for the trouble-making descendants. Each of the Disney’s Descendants were a favorite in our house. Mal (daughter of Maleficent) probably stood out as a top favorite. Our girls both noted how they like the edgy styles of both Mal and Evie (daughter of the Evil Queen). Jay (son of Jafar) and Carlos (son of Cruella de Vil) were funny and had us laughing. It was cool to see updated characters inspired by Aladdin and 101 Dalmations (always favorite of ours). 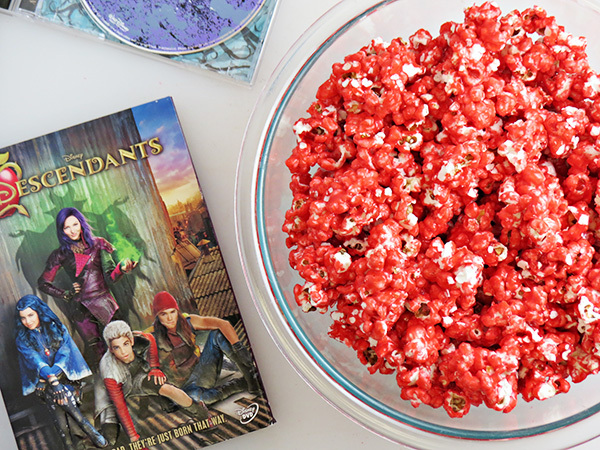 No matter who your favorite Descedants character is, we have a free printable Descendants Popcorn Box that will work for you. 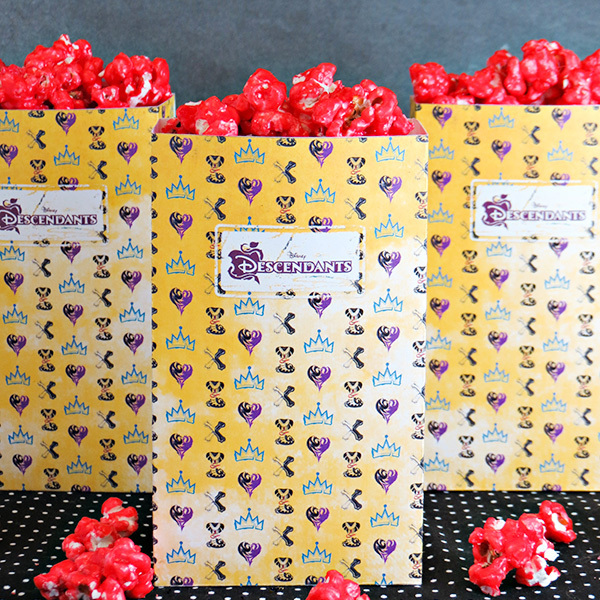 The popcorn box design features an icon representing each character: a dragon heart for Mal, a crown for Evie, a cobra for Jay, and dog crossbone for Carlos. We’ve even included instructions on how to make Wicked Apple Popcorn for your popcorn box. 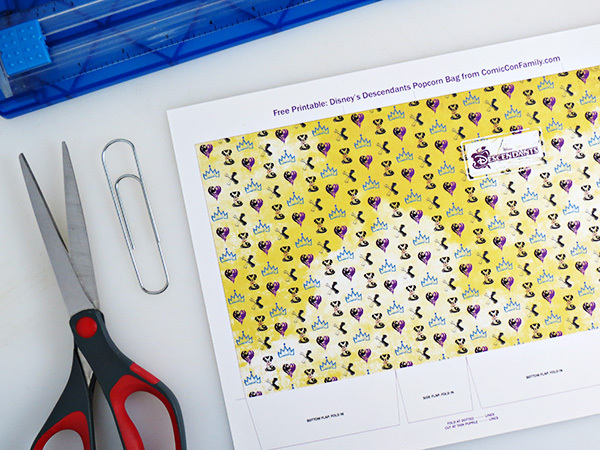 To make your own Disney’s Descendants Popcorn Box for a movie night or parties, you’ll need to print our free pattern. Just click on the image below to get your free printable. You are welcome to print as many of these as you wish for movie night, parties, etc, but please remember that these are for personal, non-commercial use. 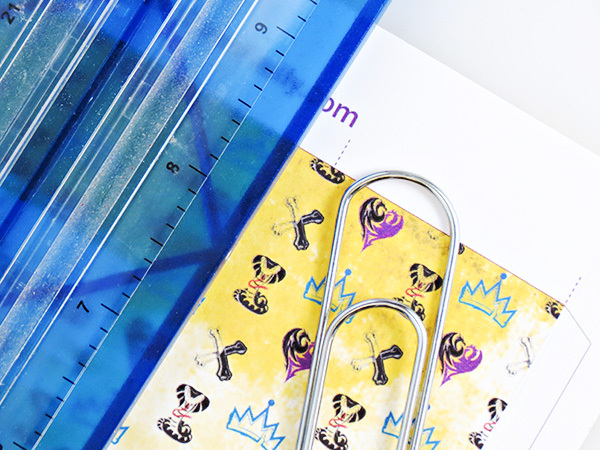 We recommend printing on white cardstock. 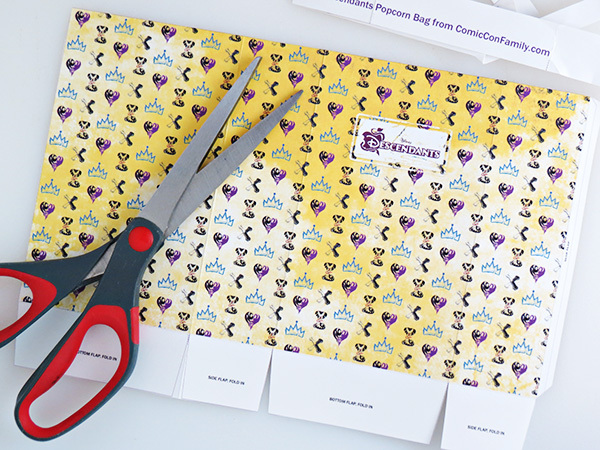 After you print the Disney’s Descendants Printable Popcorn Box, you’ll need a few other supplies too: scissors, rulers, glue stick, and a large paper clip or old plastic gift card (this will help with scoring the cardstock for folding). 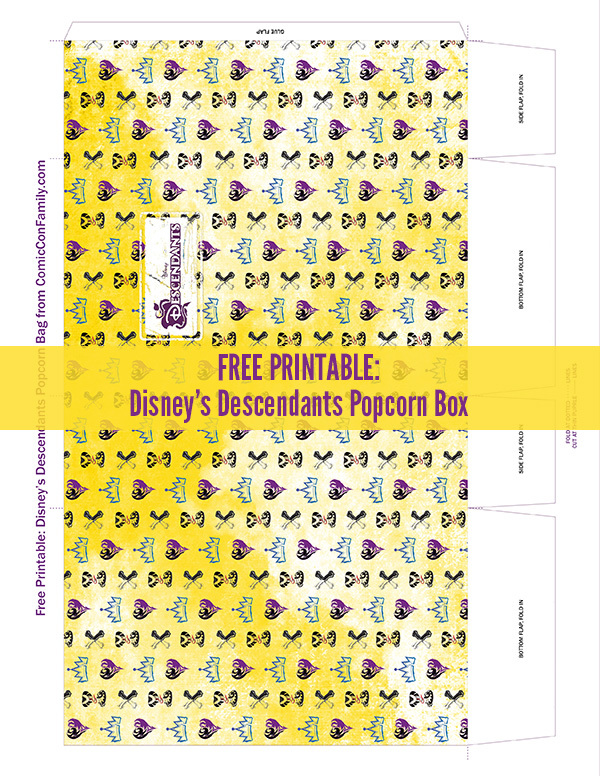 You’ll notice on the Disney’s Descendants Printable Popcorn Box that there is several areas of small purple dotted lines. These are places where you will fold the design. 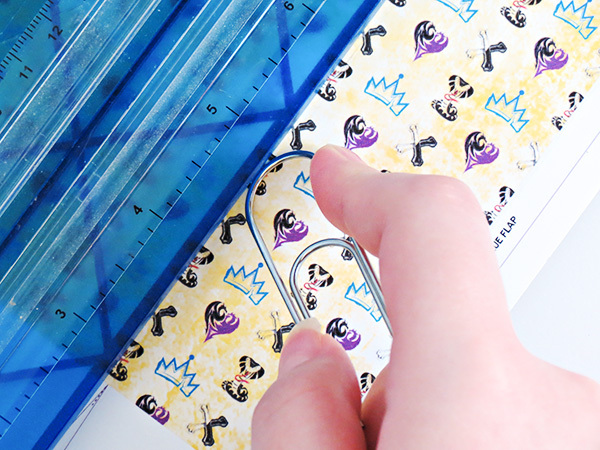 The dotted lines are placed near the beginning and ending area that will need a fold. After scoring the pattern, fold all 5 areas. After folding, cut out popcorn box by cutting along the thin, straight purple line. With a glue stick, glue popcorn boxes together. First, glue the glue flap to the inside of the box. Then, fold the side flaps in and glue them to one of the bottom flaps. Finish by gluing the remaining bottom flap to the other flaps. Press all areas together firmly to secure them. We recommend allowing them to dry and set for 24 hours before filling with popcorn. To make the Wicked Apple Popcorn, you will pop 12 cups of popcorn. If you know me, you know I love cinnamon, especially hot cinnamon candy (the hotter the better). To give this apple popcorn a “wicked” factor, I thought adding crushed cinnamon candies to the popcorn would be perfect. Take a few unwrapped candies (about 5-8 candies should be enough) and place them in a plastic zipper-style bag and crush them with a rolling pin. 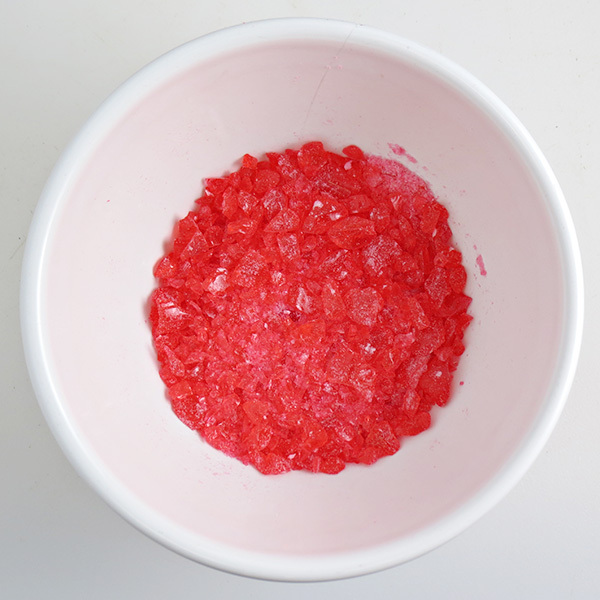 For the popcorn coating, you’ll create a sugary candy mixture, which is flavored with apple candy flavoring (look near candy making supplies) and colored with red gel coloring. Coat the popcorn with the candy mixture and then spread it out on a baking sheet. Immediately sprinkle the popcorn with the crushed cinnamon candy. You can get the full recipe at the end of this post. Once the popcorn is fully cooled, separate it into small clusters and fill each Disney Descendants Popcorn Box. Now your ready for your movie night! 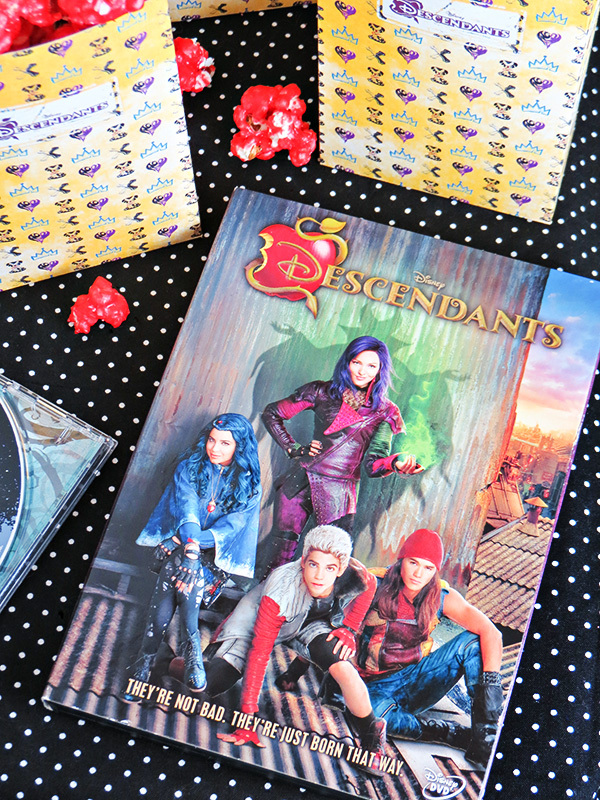 Don’t have a copy of Disney’s Descendants yet? We picked ours up at Walmart and it even came with a bonus “Isle of the Lost” bracelet. 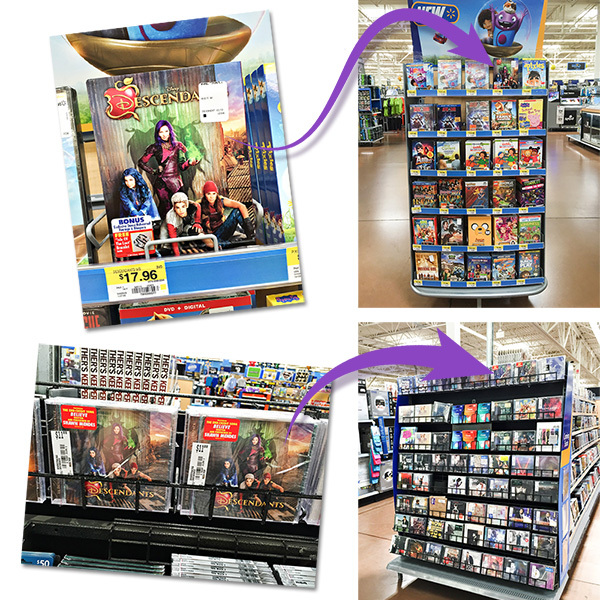 We found Descendants on the main aisle along with the other family and kid movies. 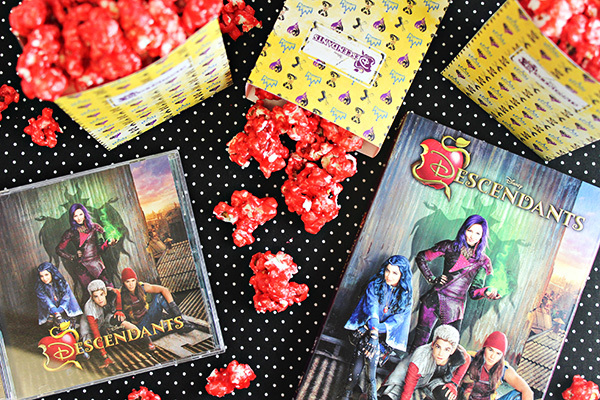 We also bought Disney’s Descendants official movie soundtrack, which was fun to listen to as we made the popcorn boxes and Wicked Apple Popcorn. We found the CD on an end cap with other new release CD’s. In a medium saucepan over medium heat, combine butter, corn syrup, sugar, and salt. Stir constantly as you bring it to a boil. Stop stirring and allow mixture to boil for about 3 minutes. Remove from heat and quickly whisk in apple flavor and color (enough to achieve desired look). Quickly whisk in baking soda. Pour at once over popcorn and mix gently to coat. Pour coated popcorn onto prepared baking sheet. Sprinkle with crushes cinnamon candy. Allow to cool completely and then break into small clusters. 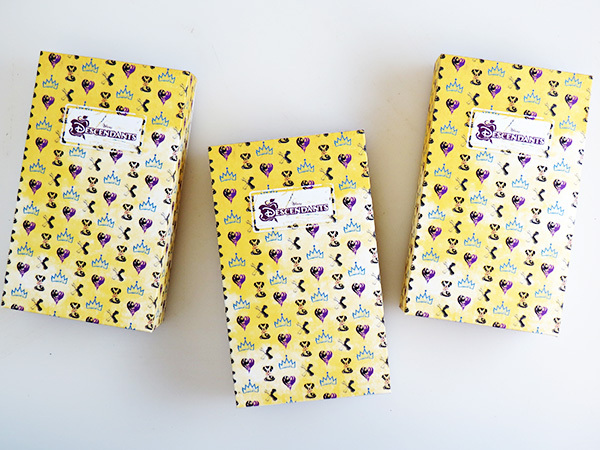 Have you watch Disney’s Descendants? 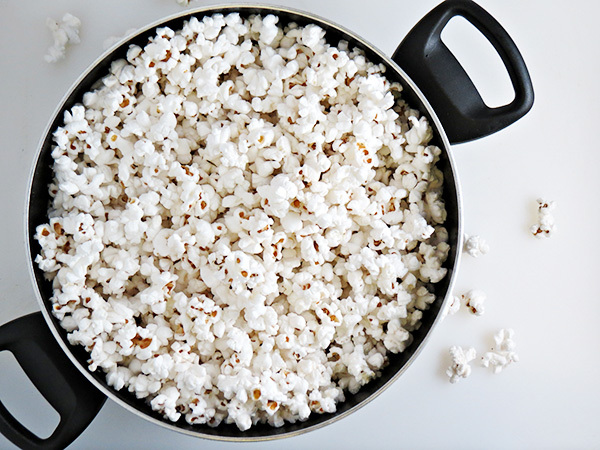 These popcorn boxes make this popular snack even more special! The apple popcorn recipe is also a nice touch. I like to drizzle fruity popcorn with melted white chocolate after putting it in the box.